After the Houston Texans’ first four offensive plays Saturday night against the New Orleans Saints, a bit of a “here we go again” fear rippled through NRG Stadium. The offense went three-and-out on its first try, got a reprieve when the Saints coughed up the punt, but then Brock Osweiler was sacked on play No. 4. But on the rest of the ensuing drive, the Texans and Osweiler displayed a sample of what they’re capable of offensively with the array of playmaking ability they added in the offseason. Osweiler hit main man DeAndre Hopkins for 8 yards. Undrafted chess piece Stephen Anderson, the talk of training camp, converted on third down for 13 yards. Lamar Miller, the Texans’ new speed back, touched the ball. And two more rookies, Braxton Miller and Will Fuller, finished off the drive. Osweiler dumped it to Miller for 11 and on third-and-7 found Fuller for a 19-yard score. What a beautiful thing that must be for head coach Bill O’Brien. Every player who touched the ball on that opening six-play drive — save for Hopkins and replacement center Greg Mancz — is brand new to the Texans. Many of those new faces helped them rebound with a better effort in the Texans’ 13-9 win over the Saints. If there was a disappointing unit, it was the offensive line, which remains a concern. Some of the shaky play up front can be chalked up to the Texans playing without four starting linemen. Tony Bergstrom slid into the starting lineup for Jeff Allen, who missed the game because of a death in the family, and Mancz replaced projected starting center Nick Martin. Left tackle Duane Brown (quad) and right tackle Derek Newton (hamstring) also sat this one out. The Texans spent big money and major draft resources to upgrade at nearly every offensive position — don’t forget that Allen got big money and Martin was a second-round pick this offseason. Certainly, adding all those pieces and weapons such as Fuller and the two Millers will help an offense that ranked dead last in average yards after the catch last season. But there’s no question that Osweiler is the man in the spotlight. No other player on this offense will attract as much attention and perhaps the criticism — that’s the vigorish, if you will, on $72 million — if things go awry like they did last season, when the Texans used four quarterbacks and flushed out in the first round of the playoffs with a miserable performance against the Kansas City Chiefs. Despite the benefit of good field position on all the Texans’ drives Saturday, there still were some disappointing results. After the Texans bogged down on their third possession, Osweiler couldn’t connect with Fuller or Braxton Miller on a few deep tries and the Texans settled for a field goal. Osweiler led them down on the next drive to inside the Saints’ 5-yard line with some nice throws, including a 17-yard conversion to Miller, but his fourth-down toss never gave Fuller a chance to catch it and was picked off. It would be Osweiler’s final attempt of the game. Some good, some bad — but it was an improvement over his first action last week. 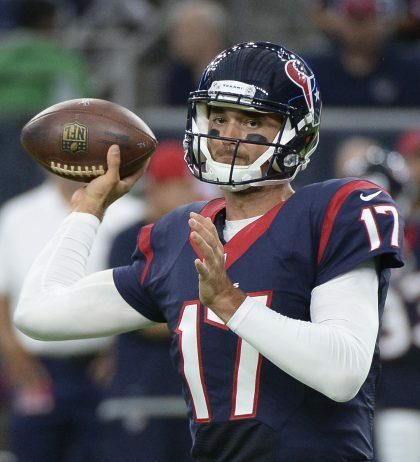 Osweiler finished the game 12-of-19 for 124 yards with a touchdown and that one pick, for a 77.9 rating. Osweiler has seven NFL starts under his belt. Even with O’Brien (who made Brian Hoyer look mostly capable, lest you forget) helping him, it’s a process. Osweiler is the rare young quarterback — he turns 26 in Week 12 — who has been benched en route to his team winning the Super Bowl, and the personal affront of that and the way Denver Broncos general manager John Elway handled his free-agent negotiations make Osweiler a motivated man to prove he’s worth the big money the Texans paid to get him. That’s a lot to go through, but it’s the kind of thing that perhaps can harden Osweiler a bit and add an extra layer of skin. But that also doesn’t mean things will be humming flawlessly on offense by, say, the time the Texans head to Denver for the Osweiler Bowl for a Monday night game in Week 7. The Texans open with three 2015 playoff teams in their first five games. J.J. Watt might miss the first two games, or more. The O-line remains a major question. There’s a lot to figure out in the next few weeks, but that process is likely to extend into the regular season. The good news is that as tough as the early season schedule is, the Texans have only one division game prior to their Week 9 bye and have only two long trips — to Oakland and Green Bay — in the second half of the season. Can Osweiler and the offense capture that rhythm by then? Saturday was the first time we have evidence that there might be some real potential here, but also a reminder that patience might be required. But there also appears to be a glass ceiling on what this team can accomplish in its first year back in town. The first and second teams looked middling at best in the preseason opener, and the idea of Case Keenum starting at quarterback — with No. 1 overall pick Jared Goff, who also cost the Rams their first-rounder in 2017, struggling early — doesn’t have too many people jacked up. Recent reports of GM Les Snead and head coach Jeff Fisher being on the verge of extensions has only added to the malaise. 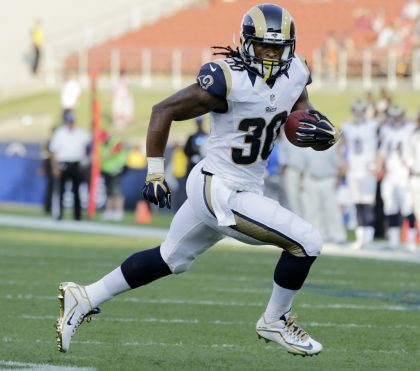 Todd Gurley made his preseason debut for the Los Angeles Rams (AP). Still, there were some positives in the Rams’ second preseason game on Saturday night against the Kansas City Chiefs. First was the return of Todd Gurley, who sat out the opener while playing it safely with his knee injury. But Gurley played one series against the Chiefs and showed why he makes a difference. Four rushes for 20 yards, including a pretty 8-yarder bounced to the outside, and a touchdown on the first drive. Keenum also played well. Before turning it over to Goff, he connected on 4 of 5 passes for 53 yards and showed great command and control. Keenum led the Rams down the field on an 11-play, 79-yard drive (with Gurley on the sideline) and hit Pharoh Cooper on an 11-yard TD pass in which the rookie receiver dove for the pylon. Keep an eye on him after Fisher seemed to suggest this week that Cooper was well locked into the No. 3 WR role. He also returned kicks and should be active early and often. The bad news? Well, the Rams’ oft-praised defense was gashed by Alex Smith, Jeremy Maclin and Chris Conley, and with Jamaal Charles still sitting out. That was a surprise, although we’re not sweating it too much. Still, it looked like there were multiple coverage gaffes and miscommunications on Gregg Williams’ unit, might be something to file away. More worry: Goff struggled early. On his first snap, Goff fired a bullet off Brian Quick’s hands. On his second, Goff tripped over his own lineman and lost a fumble — without a Chief touching him or the ball. He appeared to be a bit overwhelmed and in his own head, although Goff fired a nice strike on a slant on the next possession following the turnover and Cooper dropped what looked like a good pass. Still, Fisher should name Keenum the starter for the Week 1 game against the San Francisco 49ers. There’s little chance of Goff overtaking him at this point, even with a big third preseason game because all indications are that Keenum has been several steps ahead of the rookie in practice, too. Taking that pressure off Goff could help. That way, he could focus on getting better in what preseason is left and then learning via mental reps. Goff will get his chance in time. Fisher needs to be smart with how he handles his top pick. The pressure is on Buffalo Bills quarterback Tyrod Taylor. If his preseason performance is any indication, he’s up to the challenge. On Saturday, following the bad-news daily double of Karlos Williams being released and Marcel Dareus heading to rehab, Taylor stepped up in the preseason game against the New York Giants and looked dialed in. Taylor connected on 7 of 10 passes for 132 yards and a touchdown to LeSean McCoy before leaving in the second quarter. The pass to McCoy might have looked off target to the naked eye, with the running back having to go against momentum to catch it, but it appeared that Taylor fit it into a tight spot where only his player could make the catch. Those are the kind of subtle plays that separate a one-year wonder from a steady, quality starting quarterback. Based on the contract the Bills gave him last week, Buffalo believes in him. And with so many negative things happening around this team in recent months, they’ll need Taylor to be a leader and a reliable performer for them week in and week out. Yes, the run game should still be stout even without Williams (and Mike Gillislee reportedly left the Giants game with a concussion), but the Bills have a quartet of tricky games to open the season — at Baltimore Ravens, vs. New York Jets on a short week, vs. Arizona Cardinals and at New England Patriots — and will want balance with the defense and run game having been compromised. Carolina Panthers 26, Tennessee Titans 16: In a battle of athletic quarterbacks, reigning MVP Cam Newton — who had a strong game while he was in there — still sets the bar extremely high. He was sharp. But his counterpart, Marcus Mariota, also looked good. He completed all but one of his 10 attempts, for 104 yards and a touchdown pass. Mariota’s one incompletion was an interception, and it was an ill-advised throw (and one on which he was flat-footed). But he showed poise in his overall game, especially with a wide receiver group that’s trying to establish a pecking order. The week that Dorial Green-Beckham was traded, Justin Hunter caught only one pass but rookie Tajae Sharpe and Harry Douglas both stepped up Saturday. Mariota rolled out nicely to his right and hit Douglas on the post-corner route for a touchdown. The game was suspended because of lightning with 1:30 left in the third quarter before resuming and finishing. 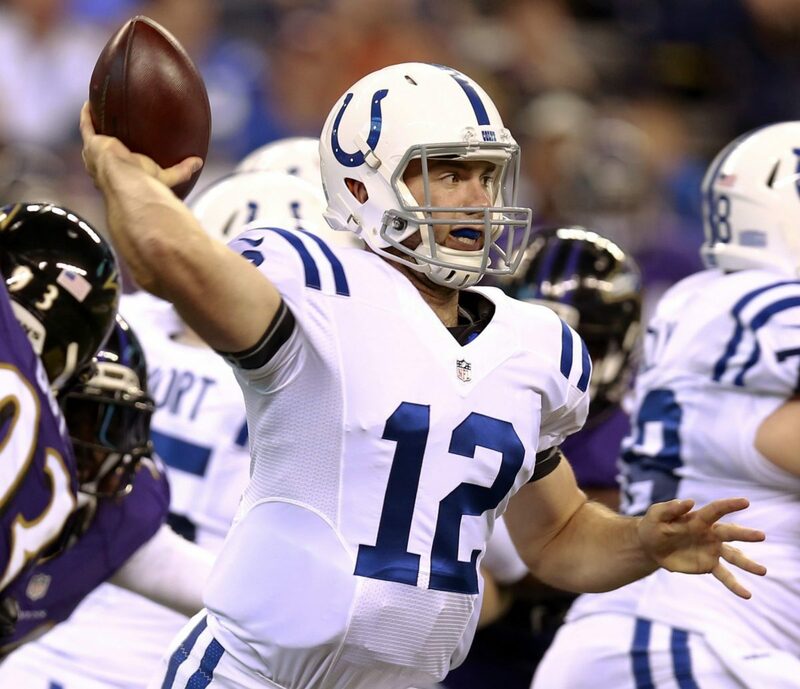 Andrew Luck hit on all eight of his passes for the Indianapolis Colts (AP). Ravens 19, Colts 18: Andrew Luck was 8-for-8 passing and looked to be different running the offense healthy and with Rob Chudzinski calling the plays. It’s hard to put too much stock into how the Ravens looked, sitting Joe Flacco, Steve Smith Sr., Terrell Suggs and several other veteran contributors. But quarterback Ryan Mallett was efficient running the offense when he got the chance, and some of the second-team defenders — such as fifth-rounder Matt Judon, coming off a massive season at Grand Valley State — opened eyes. The Ravens, who took the lead late on a returned Colts two-point attempt, won when Colts punter Pat McAfee’s 62-yard field-goal attempt at the buzzer came up short. Buccaneers 27, Jaguars 21: Amid rumors that the Bucs have received trade interest in tight end Austin Seferian-Jenkins, he turned in a good performance with three catches for 36 yards. One of those grabs was a leaping catch for a first down that demonstrated his rare athletic ability and those basketball-type skills for a big man. Although Seferian-Jenkins was called out by head coach Dirk Koetter this offseason, we don’t expect the tight end to go anywhere. Jameis Winston, who misfired on his first six attempts and threw a pick, needs all the quality targets he can get this season. Broncos-49ers: Blaine Gabbert didn’t do anything special for the 49ers, but he might have been the most competent quarterback in the game between two teams each trying to solve the position. Trevor Siemian started for the Broncos and looked good early before a horrendous pick-six. Mark Sanchez also had his moments but fumbled twice. Both quarterbacks were 10-of-14 passing. Do we know what Gary Kubiak’s plan will be against the Carolina Panthers in 18 days? More important: Does he know? • Jadeveon Clowney still hasn’t fulfilled his massive potential for the Texans. But in a week after a media member took an open shot at the injury-prone former No. 1 overall pick, Clowney came out like a man possessed against the Saints. First, he bowled over right tackle Zach Strief on a bull rush and later was seen tossing around lesser blockers in the second half, well after the Saints (and Texans) pulled the majority of their starters. It was a very good sign that Clowney still has plenty of life and could be an impact player if he stays healthy. • Eli Manning almost never misses time for the New York Giants. He is the NFL’s active leader among quarterbacks with a 183-game consecutive starts streak. That’s a good thing because his backup, Ryan Nassib, struggled for a second straight game. There had been a lot of buzz about Nassib, entering his contract season, having a good offseason and perhaps being a Taylor-like, under-the-radar free-agent signing in 2017. But following a 2-for-13 passing effort against the Giants, Nassib’s preseason totals are ghastly. He’s 9-of-27 passing for 100 yards, with two interceptions, four fumbles (two lost) and six sacks taken. Nassib needs to pick it up, even if Manning is an ironman. After all, Logan Thomas has showed he’s not roster-worthy. • How are the Panthers’ young corners coming along? It’s a mixed bag so far, but hardly discouraging. There have been very good reports about second-rounder James Bradberry, and fifth-round nickelback Zack Sanchez — playing inside for the first time — came down with an interception of the Titans’ Matt Cassel. But third-rounder Daryl Worley was beaten for a touchdown by Harry Douglas and looks like he might have trouble with quickness and double moves. • The Titans were sluggish offensively until they went no huddle. That’s something they should show more often. In both preseason games, the Titans waited until the third possession — both times when trailing — to go to the hurry-up. Both times it worked. If the Titans want to ying to the other AFC South team’s yang and run this “exotic smashmouth” offense, that’s fine. We love the concept, and it appears the Titans have some intriguing rushing potential. But what could take it to the next level would be to tire down defenses and keep them from substituting into the right subpackages by speeding things up. The mature Mariota has shown he can handle it, and they have the athletic, young offensive line to run it consistently. Not every possession — that might tax the defense unnecessarily — but perhaps with some more regularity. • Roberto Aguayo missed again?! He did indeed. Twice, in fact. The first time was, eek, a 32-yard field-goal attempt — wide right, typical FSU kicker — a week after missing his first professional extra-point try. Later in the game, the Buccaneers rookie missed a 49-yard attempt, also to the right. Is it time for the Bucs to panic about trading up for the second-round kicker? No. Aguayo never missed a try from inside 40 yards in college, and Buccaneers head coach Dirk Koetter praised his rookie’s tough-mindedness this week. Want perspective? Adam Vinatieri botched three of his first seven FG attempts and two of his first six extra-point tries as a rookie with the New England Patriots under hard-line coach Bill Parcells. And those were in the regular season, no less. But Parcells knew that Vinatieri, who was pressing, was talented and strong-willed and would come around. Parcells’ gamble paid off. Vinatieri missed only four of his 28 FG attempts the rest of the season and is entering Year 21 as the best kicker of his generation. Cut Aguayo some slack. He’ll come around.